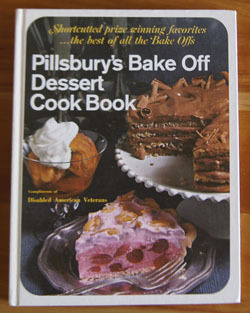 Cookbook #248: Pillsbury’s Bake Off Dessert Cook Book, The Pillsbury Company, USA, 1968, 2nd printing, 1971. This is one of Mother’s cookbooks, but she has no written notes in it. Two places in the book are marked with small scraps of paper (pages 123 and 127). I’m kind of surprised at this, because she was such a Bake-off Cookbook fan. And I was hoping for a few more memorable notes from her, as I get to the last of her cookbooks in this 250 Cookbooks blog. 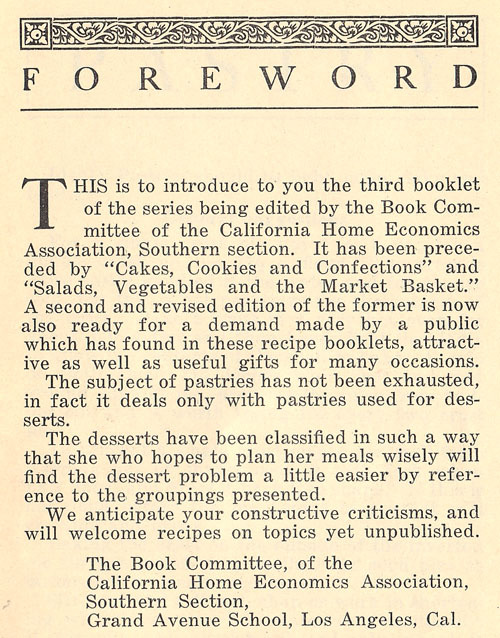 The first chapter is “Desserts Warm From The Oven”. Hmmm, sounds right up my alley. Peach Melba Special looks good: peaches and red raspberries with ginger topped with batter and baked. How about Applecots, apple halves stuffed with apricots and wrapped in dough and baked. Or Caramel Apple Pudding, a “pudding cake” with 1 1/2 cups fresh apples and 1/2 cup chopped almonds. What’s a pudding cake? It’s a cake made by placing a wet or dry batter in a pan, adding a boiling water sauce on top, and baking in the oven. Pudding cakes are one of my favorite desserts! Why? They are simple, often contain fruit, and are served hot with ice cream. Homey goodness. I found two more recipes I like in the Desserts Warm From The Oven chapter. Apple Peanut Spoon Dessert calls for 4 cups of apples and has peanut butter in the topping. Baked Apple Cuplets are peeled whole apples topped with a cake-like batter and baked in custard cups. The next chapter is “Family Dessert Favorites”. I like the Quick Banana Buns, an unusual banana dessert made from dough laced with mashed bananas cooked as buns, then filled with sliced bananas and whipped cream. 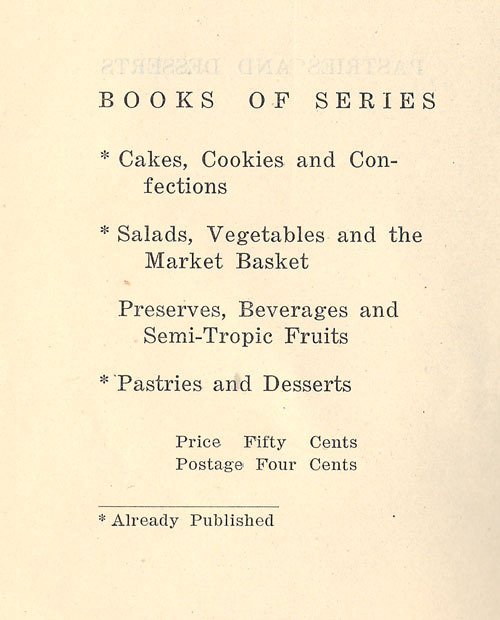 The final three chapters are “Pies, Pies, And More Pies”, “Make-Ahead Pies and Desserts”, and “Conversation Piece Pies And Desserts”. Hey – no chapters for pies and cookies! There are a few cake-type recipes in the other “Dessert” chapters, but that is all. It’s not until page 136 that I find the recipe I want to make for this blog: “Cherry Honeys”. Why do I like this? Because it has fruit and honey in it, and I can cut calories by using Cool Whip® instead of whipping cream. Sour cream and coconut are folded into the whipped cream – an unusual and tasty-sounding twist. The serving sizes are small and designated so we can stay on our “diet” and still have these. 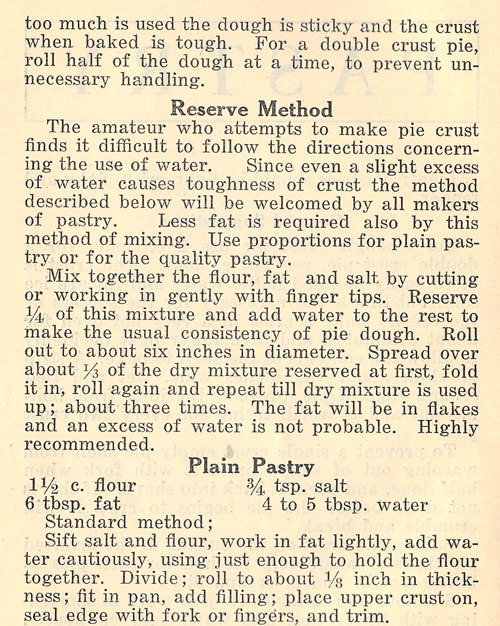 Of course, I’ll make my own pie crust instead of purchasing pie crust mix. Plus, they should look really cute and pretty! And I have to admit, I get to buy something new to make these: tart pans. I have quiche pans of many sizes, custard cups, many sizes of ramekins, small and large donut pans, bun pans, bundt pans, small and large spring form pans, cake pans, popover pans, lava cake pans, muffin pans – but NO mini tart pans! Divide the dough into 6 pieces. Roll each into a circle to fit 4-inch tart pans. Fit them into the pans, forming a standing rim, and flute the edges. Bake at 450˚ for 8-10 minutes, or until golden brown. Cool. Drain the cherries and save the juice. Add the cornstarch to the juice and mix well, then add the honey and orange peel. Cook over medium heat, stirring until the mixture is thick and clear. Remove from heat and add the cherries and lemon juice. Cool. Beat the whipping cream until thick, then fold in the coconut, sour cream, and sugar. 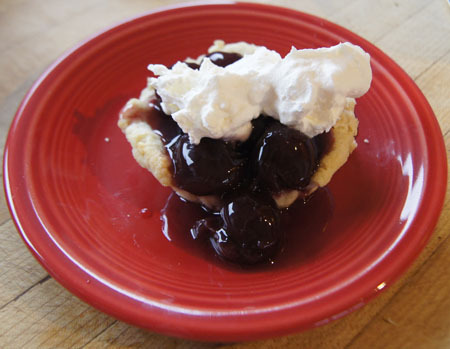 Just before serving, spoon the cherry filling into the tart shells and garnish with the whipped cream mixture. These were excellent. Except for the crust, they aren’t terribly rich. The next night, I made another batch of the cherry mixture and served them with ice cream. Yum! 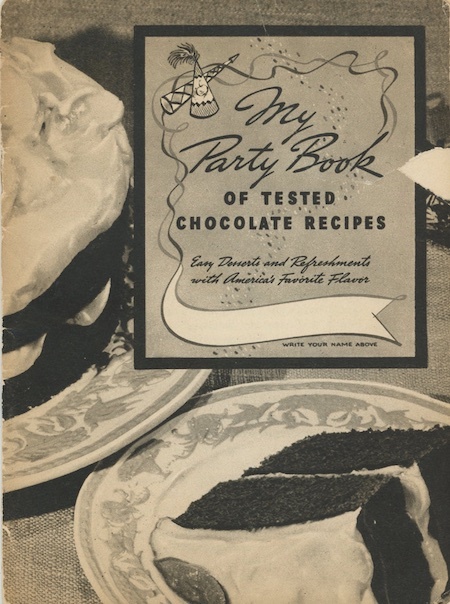 Cookbook #242: My Party Book of Tested Chocolate Recipes, General Foods Corp. – 4012, USA, 2nd Ptg., 1938. “Now what can I serve that everyone likes?” you ask yourself when you plan party refreshments. And if you decide on “something chocolate” you’re sure to be right. For Chocolate is America’s favorite flavor. 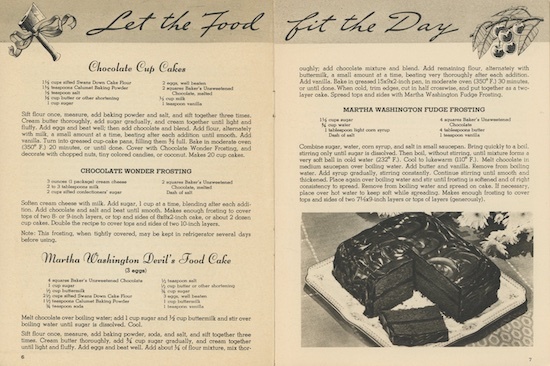 As a true American, I do love chocolate, and would love to try every recipe in this cookbook! “For over150 years Baker’s has set the standards for fine chocolate”. 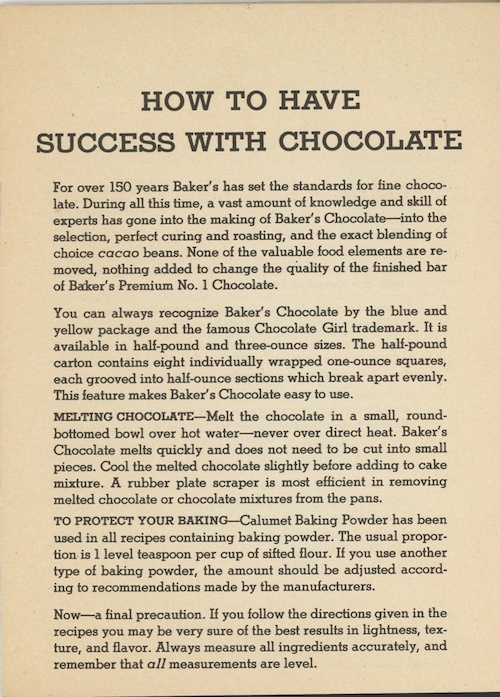 Since this book was published in 1938, that means Baker’s Chocolate was formed in 1788 or earlier. Let’s check. I pull up Wikipedia’s entry for Baker’s Chocolate. In 1764, John Hannon and Dr. James Baker of Massachusetts began a business importing cocoa beans from the West Indies. Dr. Baker took over the company in 1780, when Hannon did not return from a sailing trip. 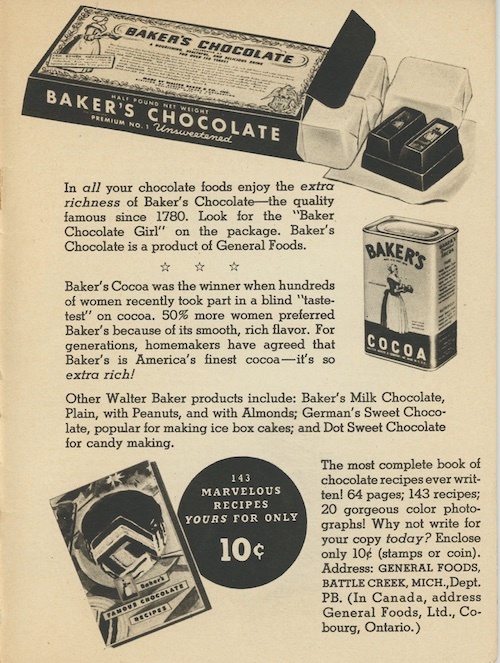 Baker renamed the company “Baker’s Chocolate”. So, the claim is correct. Chocolate itself was discovered in meso-America (Wikipedia’s History of Chocolate). The Americas had chocolate before Europe – sometimes I forget that! From the above label, we can see that one-half an ounce of baking chocolate has 90 calories, 78% from from fat, with a small amount of dietary fiber and 2 grams of protein. No vitamin A or C, no calcium, but some iron. Valuable food elements, yes, I guess. But nowadays – unlike 1938 – chocolate, especially dark chocolate, has been found to be chock-full of trace nutrients and antioxidants and more, as in this article on HealthLine. I learn from a web search that baking chocolate (unsweetened chocolate or bitter chocolate) is cooled, hardened chocolate liquor, which is melted ground cocoa, and it contains between 50 and 58 percent cocoa butter. 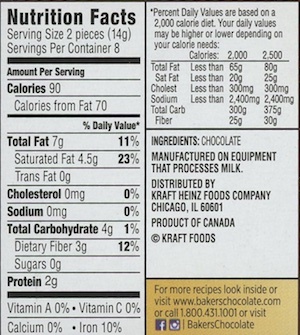 On the other hand, unsweetened cocoa powder has 46 grams of fat in one-half ounce, 50% from fat. It is made from roasted cocoa beans that are ground into a fine powder. 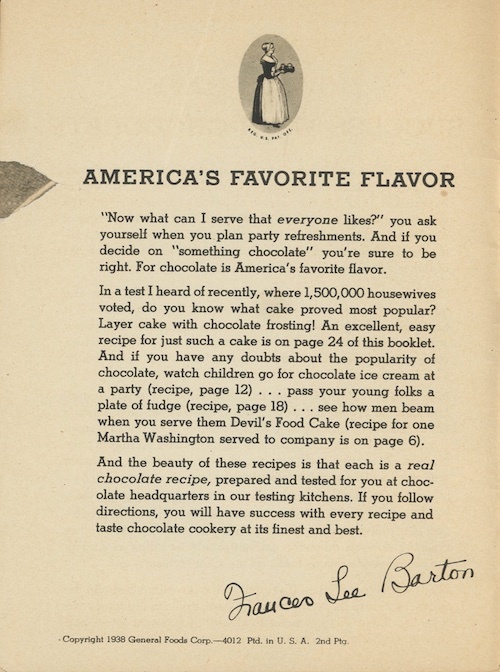 Baker’s unsweetened chocolate is no longer sold in a “blue and yellow package” but the “famous Chocolate Girl trademark” is still on it. Today the package is yellow, orange, and brown. I included this package in the photo I took of the recipe ingredients, below on this page. Ironically, my package also indicates that Baker’s chocolate is now manufactured in Canada. Where did I get this cookbook? I think I got this from my mother’s collection, or perhaps it was my grandmothers. No recipes are marked. Today I find it available on several online used-book stores for about 3 dollars. And, full text is available on the Hathitrust website. Here are some examples of recipes. 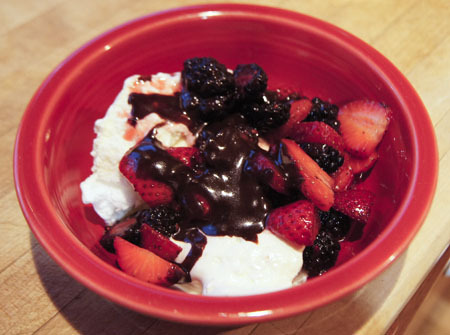 I decide to Chocolate Sundae Sauce for this blog. This ought to be a good project for my 4 year old grandson to help me with. He loves mixing things! Plus it will be special to have homemade sundae sauce over ice cream for a simple dessert for all of us. Put the chocolate and the water in a sauce pan. Bring to a boil and cook 4 minutes, stirring constantly. Add the sugar and salt and boil 4 minutes longer, stirring constantly. Serve hot or cold over ice cream. 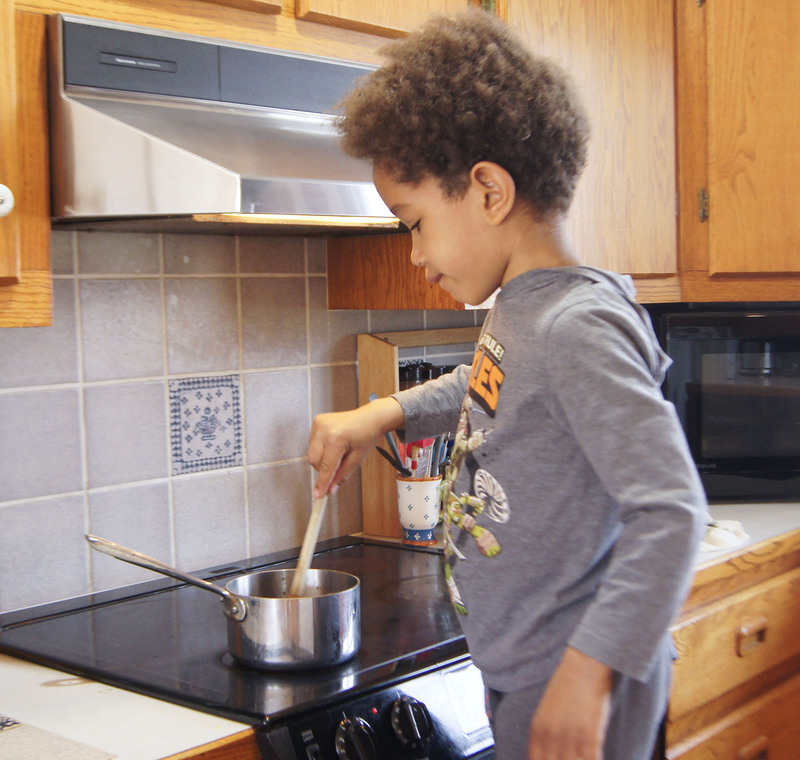 Here’s my helper, doing the stirring chores! Later, after dinner, we enjoyed the sauce over vanilla ice cream and berries. Yum yum yum! It was pretty special to have our own homemade sauce. This sauce will store – we had a little left over. The next day it was stirrable at room temperature, but pretty thick, and would not pour unless heated. Not a real problem, just heat in a microwave oven – a convenience that was not available in 1938. Below are scans of the front cover, back cover, and the inside-back cover. 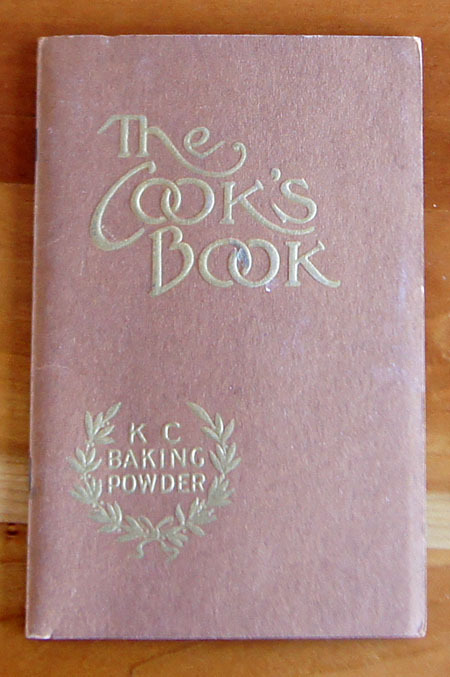 Cookbook #236: The Cook’s Book, K C Baking Powder, Jaques Manufacturing Co., Chicago, 1935. Can I go back to 1935? I want my cake, and to have it good for me too! This book is all about how to use baking powder in recipes for cakes, cookies, and breads. 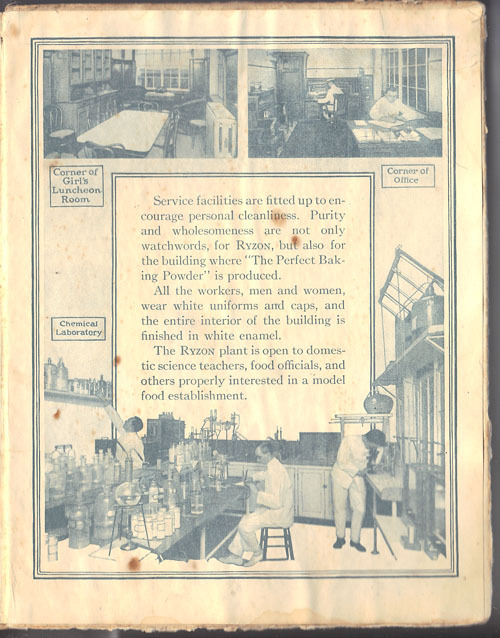 I talked about baking powder and how it works In my post on the 1917 Ryzon Baking Book. 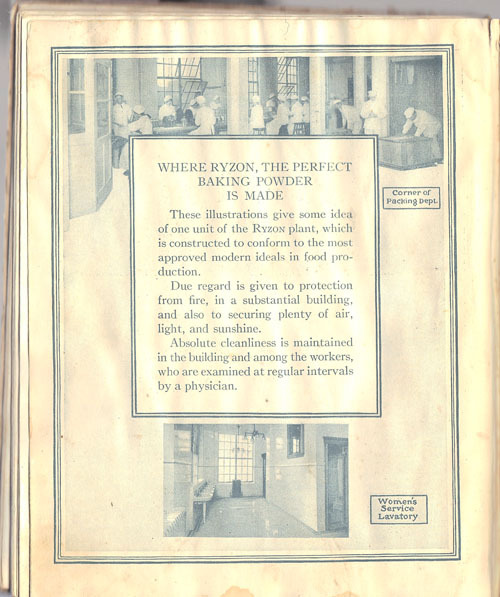 Ryzon was a brand of baking powder sold for a short period around 1917. 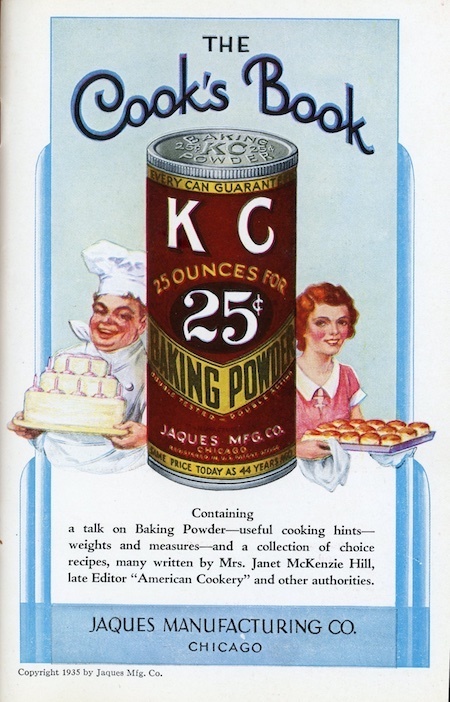 According to the Clabber Girl website, “KC Baking Powder was originally manufactured by the Jacques Manufacturing Company in Chicago, Illinois before the brand was purchased by the Clabber Girl Corporation in 1950.” Clabber Girl is the brand of baking powder I currently have in my kitchen. 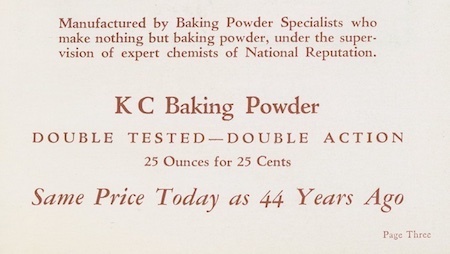 How much did a can of K C baking powder cost? Jaques Manufacturing Company was given the Distinguished Service Award. 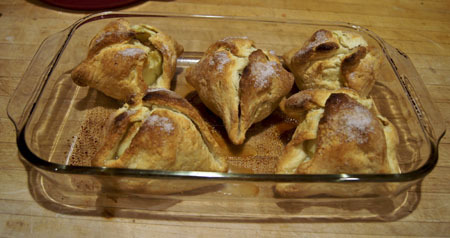 “K C Old-Fashioned Apple Dumplings” is what I decide to make for this blog. This is about the only recipe in this book that doesn’t have sugar in the dough/batter! I decide to try whole wheat pastry flour instead of all-purpose flour. 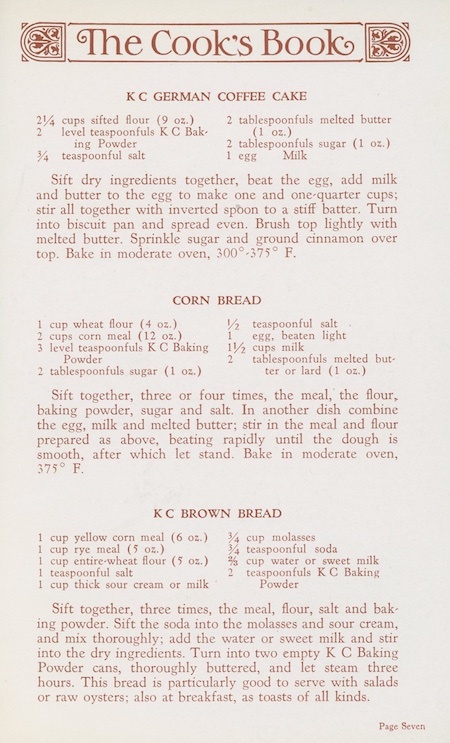 Other recipes in this book (but not this one) call for “entire wheat”. Entire wheat flour is wheat flour made from the whole grain, what we now know as “whole wheat flour”. Whole wheat flour has the same number of calories but a significantly lower glycemic index than white wheat flour. Briefly, the glycemic index of a food reflects how fast a carbohydrate breaks down into sugar in the body. Level sugar levels are (currently) the advice of nutritionists. Both white and whole wheat flours have the same number of calories, but the whole wheat flour has less of a tendency to cause blood sugar spikes. Sugar has the highest glycemic index of all. Since we are low-carb-ing and not no-carb-ing, we eat some bread, and whole wheat is our wheat flour of choice at the moment. I am (sadly) frowning on sugar, so I’ll use just a touch of sugar and a little no-calorie sweetener to make this qualify as a dessert. I’ll skip the suggested hard sauce made with butter and sugar. How long and at what temperature should I bake these? The recipe doesn’t specify. 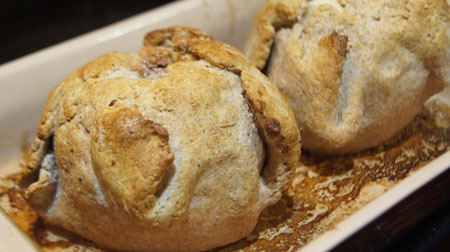 Online, I found a similar recipe for apple dumplings, and they bake them at 400˚ for 50-60 minutes. I know my oven, and I think I’ll try 375˚ and check them starting at 40 minutes. 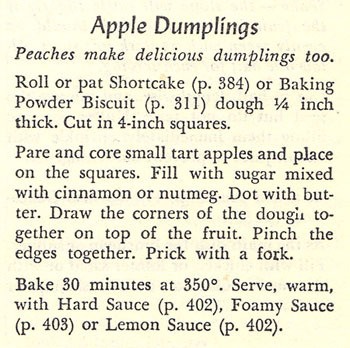 Note: I have a better recipe for Apple Dumplings, one from the Fannie Farmer Cookbook. I didn’t realize I’d made these before! Stir together the flour, baking powder, and salt; work in the shortening and mix to a dough with the milk. If necessary to make a soft dough that holds together, add more a bit more milk. Divide the dough in half. Roll each half to a square one-third inch thick. Put an apple on each square and fill the apples with cinnamon and sugar to taste. Draw the dough up to cover each apple and make it smooth. Bake in a lightly butter pan at 375˚ for 40 minutes, or until golden brown. These tasted good, but only healthy-good. We split one dumpling for dessert, topped with cool whip, and ate every morsel. We were very hungry! I’d say, my way with whole wheat flour is just not as good as a white flour and apples full of butter and sugar with lots of hard sauce. If you are going to have dessert, have dessert. I would not make these apple dumplings this way again. 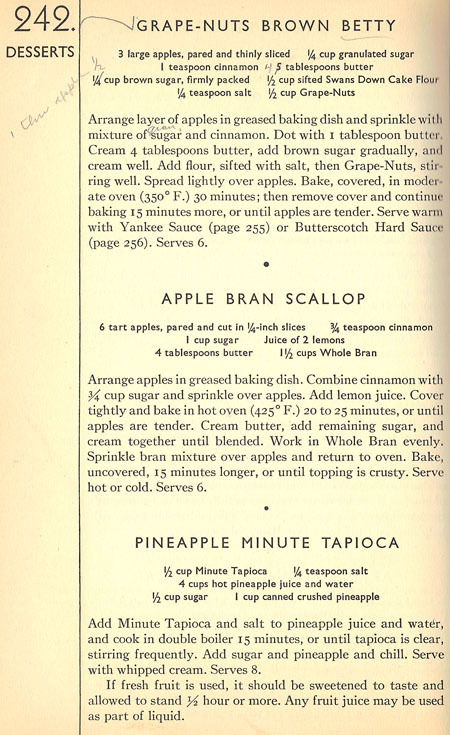 I suggest using white flour in this recipe, and putting more goodies in the apple cores, like butter and lots of sugar, and serving them with the hard sauce or rich ice cream. Desserts are, after all, meant to be overindulgence. In this I will have to disagree with The Cook’s Book. I have learned that I can’t eat cake made with flour, sugar, eggs, and butter every day or I will gain weight and the health care professionals will say that I am not healthy. 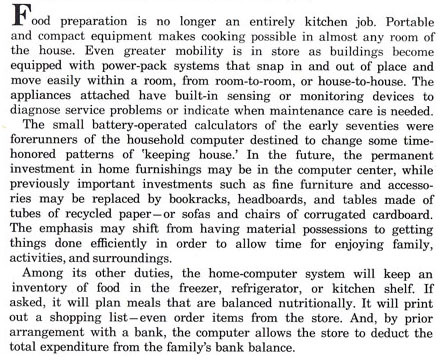 Maybe in another 78 years (The Cook’s Book is 78 years old), it will be a different story for the human population. The last page in The Cook’s Book. A chemistry lab! 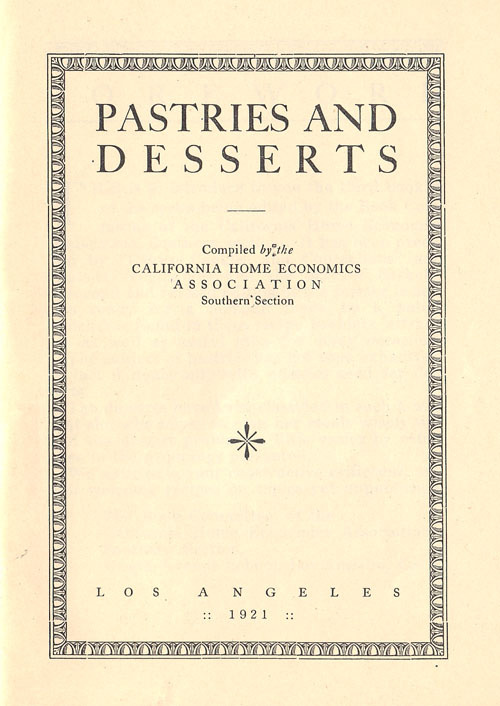 Cookbook #219: Pastries and Desserts, California Home Economics Association, Press of Clyde Browne, Los Angeles, Cal., 1921. This might have belonged to my maternal grandmother. There is very little handwriting in it, but what there is looks like hers. Or it might have come from Ruth Vandenhoudt, since it is from the same cookbook series as Salads, Vegetables and the Market Basket. There are a few food and age stains, but it is actually in pretty good condition for being 96 years old! I have two copies, and one is missing the cover. Clyde Browne, was a self-identified printer, according to a 2014 article in KCETLink. From the KCETLink web site: “. . . Southern California bohemians, whose ideals and aesthetics were inspired by the Arts and Crafts movement, valuing craftsmanship, beauty, nature, and community. Settling along the Arroyo Seco, between Pasadena and Highland Park, these inhabitants created what Kevin Starr calls the ‘Arroyoan ideal: the spiritualization of daily life through an aestheticism tied to crafts and local materials,’ that is ‘expressed primarily through the home. '” Clyde Browne also has a Wikipedia entry. Sounds like Clyde was a Bohemian, a beatnik, a hippie, a New Age person. Someone who would be right at home in Boulder, Colorado. 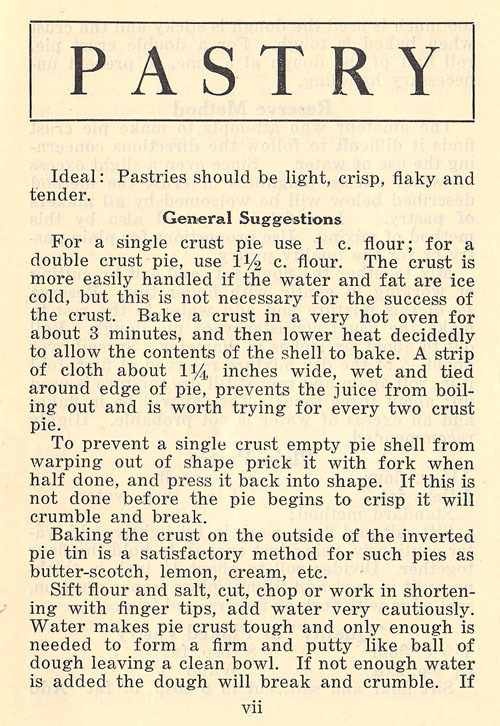 The first recipe in the booklet is for pie crust, below. These directions represent the style of writing throughout the booklet. I’ll let you read it and judge for yourself. 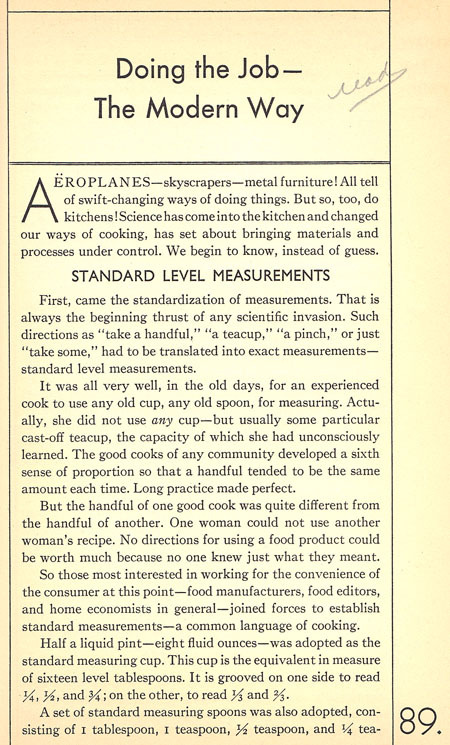 (This is from the era before mixers, food processors, or even pastry cutters.) Note the directions for oven temperatures: “bake in a very hot oven for about 3 minutes, and then lower the heat decidedly”. Here is how to intrepret older oven temperature descriptions to degrees Fahrenheit. Note that besides the instruction “hot oven for 3 minutes”, no time is given for baking the crust. 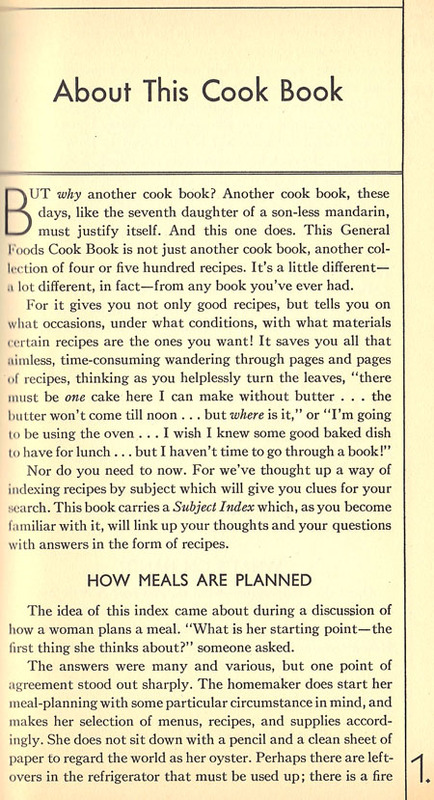 This is true throughout this 1921 cookbook. The baking recipes just say “cook until done”. 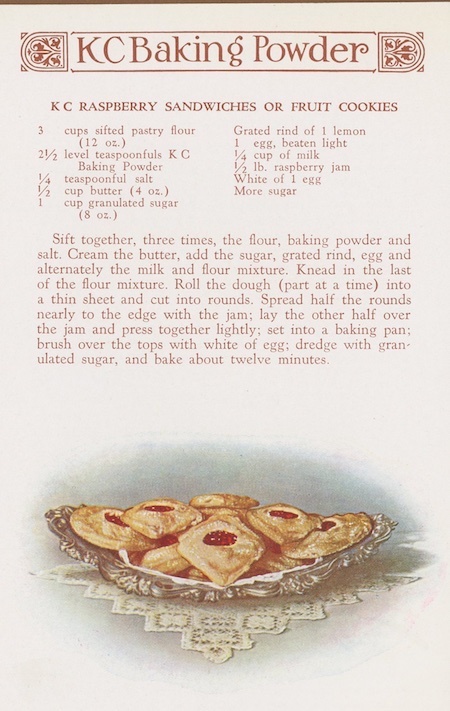 Some of the recipes for steamed puddings have a designated cooking time, but the desserts cooked on the stove top do not. Pie recipes include: lemon chiffon, berry, southern tomato, rhubarb, raisin, custard, mock mincemeat, cottage cheese, banana cream, and more. Tarts can be adapted from any of the pie recipes. 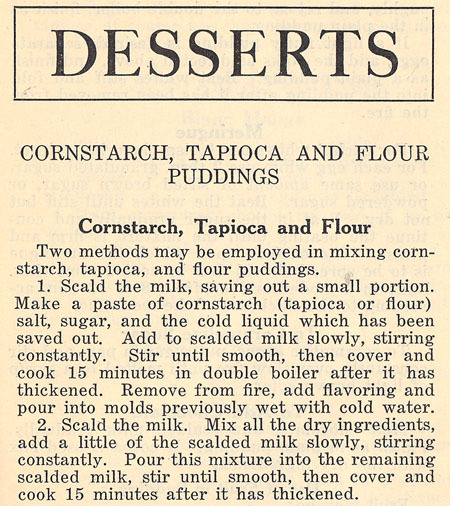 Puddings are thickened with cornstarch, tapioca, and flour. 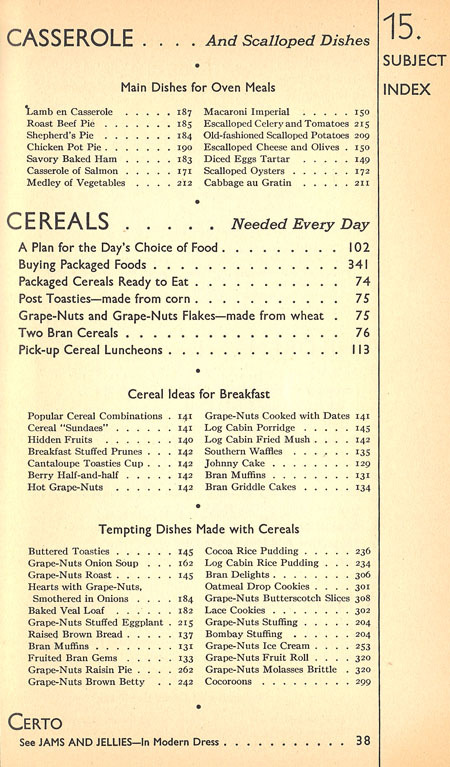 Cereal desserts are made from rice, cornmeal, bread and cracker crumbs. There are custards, fruits (raw and stewed and baked), and rose apples using red clove candies. Fruits include cranberries, oranges, apples, bananas, berries, grapes, figs, melons, pineapple, peaches, prunes. Gelatine desserts are based on plain gelatin (not jello). Baked puddings include dumplings, cobblers, and roly poly. 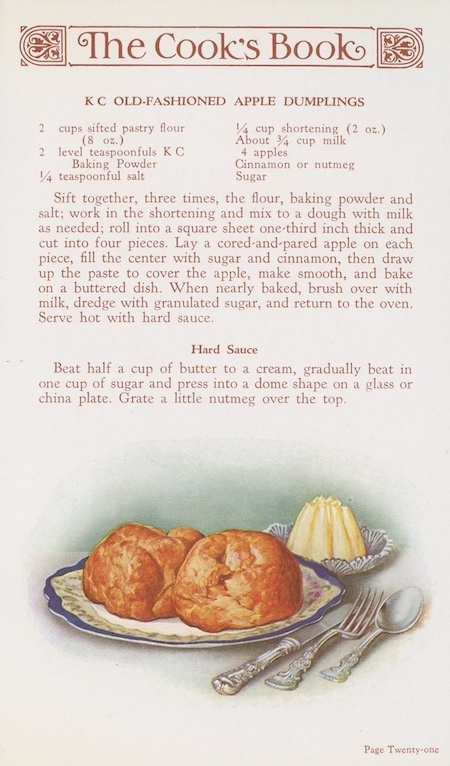 Steamed puddings include carrot, cherry cup, chocolate, fruit, gingerbread, Hazzard Delicious (butter, sugar, nuts, flour, baking powder, milk, eggs), persimmon, plum, and suet. There are rosettes, timbales and fritters. Frozen desserts include fruit ices: ice cream from milk, cream, sugar and eggs, simply frozen, not churned, with variations including chocolate, orange, pinneapple, caramel, coffee, fig, tutti frutti, grape nut, maple, peppermint, and ginger. Mousses (a standard recipe with suggestions for flavoring) and parfaits (frozen desserts made with eggs, syrup) are included. The last section is sauces for puddings (cooked without eggs, cooked with eggs, uncooked with eggs), and sauces for ice cream. 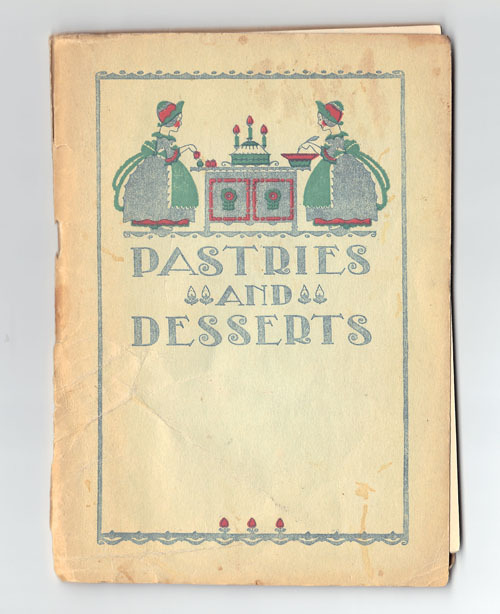 Very few recipes in this booklet include chocolate! I decide to make Tapioca Cream for this blog. Our grandson will join us for dinner and I think this is a fairly nutritous dessert because it includes milk and eggs, is relatively low in sugar, and has no added fat. Tapioca is a starch made from cassava root. In the US, it is mainly used as a thickener, but in triopical areas of Africa and Asia, cassava is a staple food. Cassava is low in nutrition: it has no protein or fiber, is low in calories (important in areas of the world where food energy is a plus), and has insignificant amounts of viatmins and minerals. In the US, tapioca is sold as “minute tapioca” (and has been sold that way since at least 1921). I’ve also tried pearl tapioca – big round lumps of tapioca. I learned that you do not have to scald milk from my book Kitchen Science. Therefore, I will simply mix together the tapioca, sugar, salt, and milk. Shall I use a double boilier to heat this mixture? 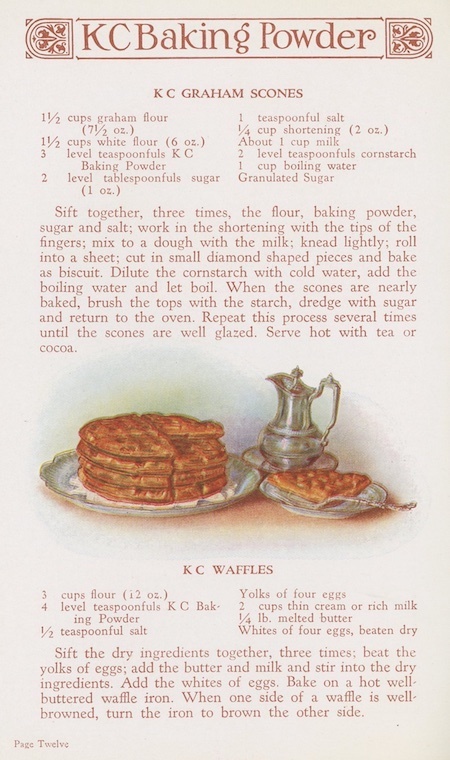 I suspect that in 1921, you needed to cook in a double boiler to control the stove top temperature – note that the recipe says “remove from fire”. “Fire” sounds harder to control than today’s stove top burners! So I won’t use that step, but simply cook it in a saucepan on the stove top. Also, I will beat the egg whites with 3 tablespoons sugar, according to the instructions on my current package of minute tapioca. The modern recipe calls for 2 tablespoons less sugar and leaves out the nuts. Combine the tapioca, sugar, and salt in a cool pan, then add the milk and egg yolk. Let stand 5 minutes. Heat the mixture to a full boil on medium heat, stirring constantly, then remove from heat. Let stand 20 minutes to cool. Beat the egg white on high speed until soft peaks form. Gradually beat in 3 tablespoons sugar until stiff peaks form. Fold the egg white mixture into the tapioca-milk mixture. Fold in the vanilla. 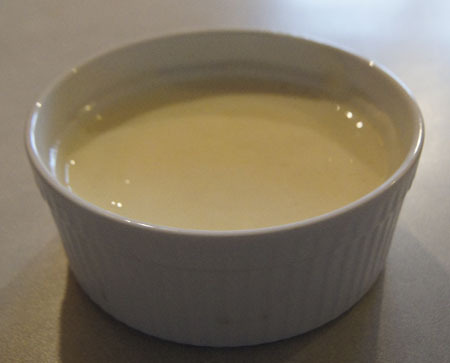 You can divide the pudding into single servings or not; you can serve warm or chilled. I made only three custard cups, and it served three people! It was so good – I hadn’t made it in years and it’s a comfort food to me. I put some sliced strawberries on top and served it with cookies. My grandson liked to dip those cookies in the pudding! Note: I used 3 tablespoons tapioca, as it stated on the package. But I would have liked it a little thicker, so I’d suggest the 4 tablespoons tapioca as written in Pastries and Desserts. 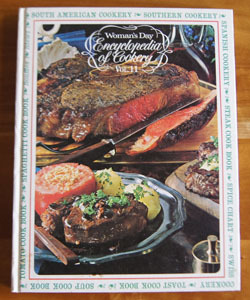 Cookbook #218: Encyclopedia of Cookery, Vol. 11, Sou-Ton, Woman’s Day, Fawcett Publications, NY, 1966. I have a set of twelve Encyclopedia of Cookery volumes and this is the eleventh of that set – I covered the first ten in previous posts. 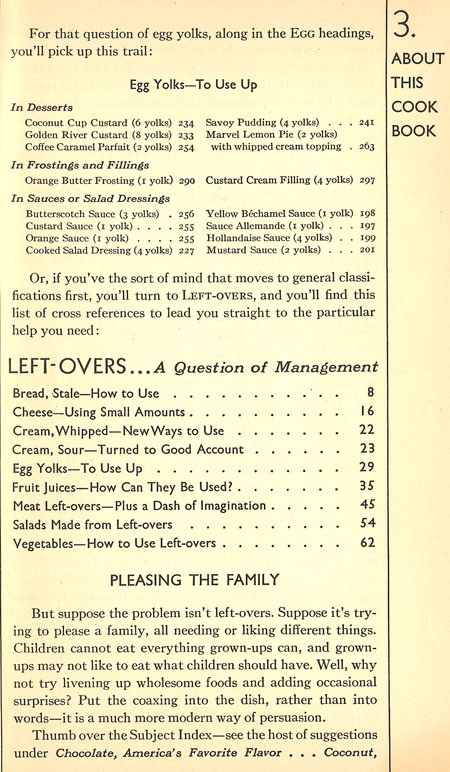 This volume covers curious and helpful information about foods from (sou)fles to (ton)gue. I love that: “a rule of the kitchen”! This volume of the Encyclopedia of Cookery has a lenghty and good explanation of how to make a basic entree souffle, suggesting many variations. 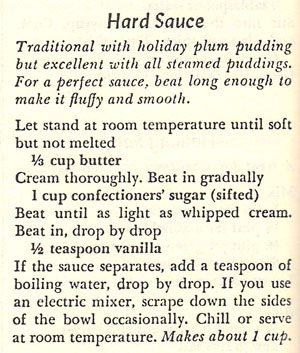 And, it includes a recipe for Liqueur Souffle with suggested variations. The Soup Cookbook is 8 big pages long. The last entry is a soup garnish called “Twist Toast”. Sour Cream in its simplest form is “unpasteurized heavy sweet cream that has been allowed to stand in a warm place until it has become sour”. Commercial sour cream is made from “sweet cream chemically treated with lactic-acid bacteria to produce a thick cream with a mild tangy flavor”. The South American Cook Book begins with an interesting essay by Jean Gormaz on the widely varied cooking of this continent of many climates. 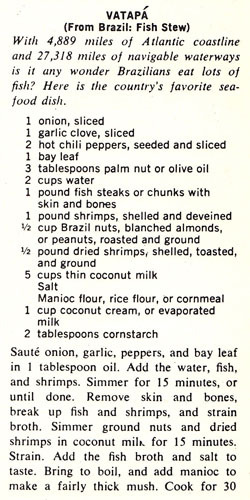 Vatapa, a fish stew from Brazil, illustrates the variety of ingredients in South American cookery. Cook books called Southeast Asian Cookery, Southern Cookery, and Southwest Cookery follow each other with no short entries between. 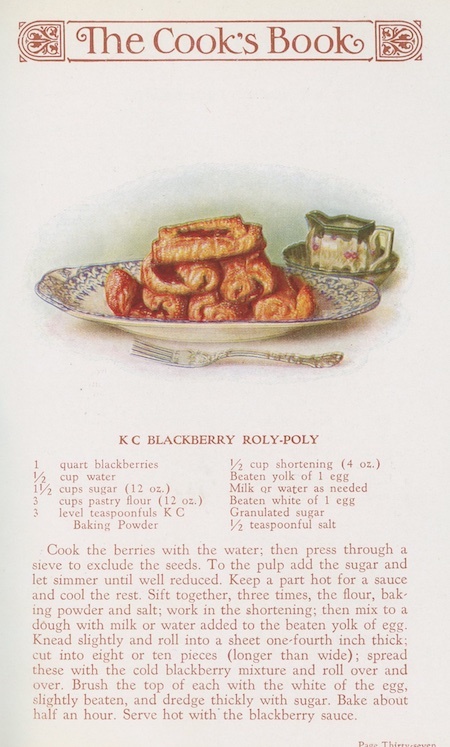 (This volume of the Encyclopedia of Cookery sure has a lot of cook books in it.) The Southwestern cook book includes few dishes familiar to me, except chili sauce, tacos, and sopapillas. 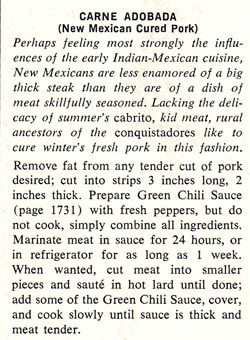 Carne Adobada is an example of a recipe I have never heard of before, and it takes days to make. Finally, I come to a short, non-cookbook entry: Soybeans. “The soybean is one of the world’s oldest plants. It has been cultivated in China for over 4,000 years.” “Bean curds” are mentioned, but are not called tofu. Most of the recipes in this section include soy sauce as the “soybean” ingredient. Spaghetti, Spanish Cookery, spare rib, spearmint, spice. The spice section is rather short, recipe-wise. 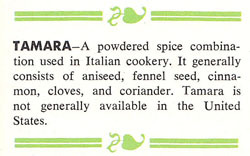 It has a two-page illustrated chart, but only includes 12 spices. “Spices – Nature’s Flavor Magic” is an essay on the importance of spices in history. The section on steaks includes a charcoal broiled cookbook. It’s writtten by Philip S. Brown, and I like it. He comments in the first person throughout the recipes. I’d like to try his “Teriyaki”, made from marinated round steak strips woven back and forth on skewers and grilled. Sterilize, stew, stir (entered as “stir, to”), stock. Stollen is a sweet, fruit-filled yeast bread baked in the form of a folded-over roll. That sounds like a recipe up my alley. Strawberries are native to both the old and new world. The Encyclopedia of Cookery claims wild strawberries are the best – I’ve never had a wild strawberry! I have had small-farm grown fresh cultivated strawberries, though. I grew up in Southern California, where strawberry fields were abundant. Strawberry shortcake was an oft-made dessert at our home. Strudel, stuffing, sturgeon, sucker (a fish), suet (hard fat from around the kidneys), sugar, sundae. A cookbook on Swedish Cookery. Sweetbread is “The thymus glands of lamb, veal, or young beef (under 1 year; the thymus disappears in mature beef). Sweetbreads consist of two parts: the heart sweetbread and the throat sweetbread.” According to the entry, sweetbreads are widely available year round fresh and frozen. I’ve never seen them in stores. Then again, I’ve never looked. Sweet potatoes are the root of a perennial vine of the morning glory family. Sweet potatoes are not yams – yams are a completely different botanical species. Sweet potatoes are native to America. Many recipes are in the Sweet Potato Cook Book. Sweetsop refers to both a small tropical American tree and its sweet pulpy fruit, also called the sugar apple. Swiss Cookery is a collection of recipes authored by James A. Beard. Syrup is a sweet, thick, sticky liiquid. It is made from a concentrated solution of sugar and water, and can be flavored with chocolate or the juice of a plant, for example, corn syrup, or from the concentrated juice of plants like sugar cane or maple trees. (It does not mention 100% maple syrup.) The taffy entry has a recipe for homemade taffy. A tangelo is a hybrid of the tangerine and garpefruit. Tangerines are named after Tangiers, but originated in China. Tapioca is made by heating the starch of the manioc tuber. I find that manioc is also known as cassava and yuca. Tarts are filled pastries, often sweet, but also savory. 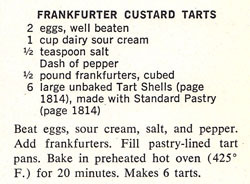 Here is a recipe for Frankfurter custard tarts. Tetrazzini is a dish I discussed in All-Time Favorite Casserole Recipes. Thanksgiving includes an essay and many traditional recipes. Toast again! Toast was really popular in the 1960s. The “Toast Cook Book” is 5 pages long. A tomato is a fruit native to South America, and the Tomato Cookbook gives lots of recipes for its use. Well. On that note, I end volume 11 of the Encyclopedia of Cookery. Now, what to make for this blog? I decide on “Strawberry Shortcake”. Why did I choose this recipe? I have been making strawberry shortcake for years. But I have always started with my mother’s basic biscuit recipe, and just added “a bit” of sugar. This is an actual “shortcake” recipe. Plus, I like the way the dough is rolled out into a big circle and baked in a cake pan. Saves a step in cutting out the biscuits. And finally, I had some strawberries in the refrigerator looking to be used! I made a one-third recipe for the two of us and had enough for dessert for two nights. Stir together the flour, baking powder, salt, and sugar. Cut in the shortening. Mix the half egg and milk, then add to the flour mixture slowly, mixing with a fork, just until it makes a soft dough. On a floured board, knead the dough lightly for about 20 turns. Roll or press into a 9-inch circle. Place in a lightly greased 9-inch cake pan. Bake at 450˚ for about 15 minutes, until golden brown. Meanwhile, slice the strawberries and add a tablespoon or so of sugar. Stir and allow to macerate until you serve the shortcake. To serve, split the baked shortcake into two layers. For us two, I first cut the shortcake into two half circles, then quarter circles. I took two quarter circles and split each quarter into two layers. Layer one shortbread, half the berries, another shortbread layer, the rest of the berries, and then put whipped cream (real or fake) on top. This was excellent! I like the egg in the dough, and I like rolling it into one circle instead of biscuits. My dining partner said “yum, but not enough!” I take that as a thumbs up. Cookbook #166: Golden Treasury of Cooking, Better Homes and Gardens, Meredith Corporation, USA, 1973. One foot in the past, and one in the future. My cooking philosophy for sure. And the present? That’s where I am, thinking about what to learn, to discover, and to cook today. 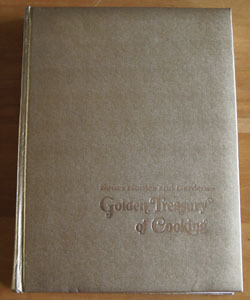 This week, I decided to take the Golden Treasury of Cooking off the shelf. I’ve been putting this one off because I know it will take some time. This is a special book, a super-collection of nostalgic recipes, and handsomely illustrated and presented. But more than that, it was given to my mother from my father for Christmas 1973. The Golden Treasury of Cooking a gorgeous book. Although now faded, the cover is golden, and a little puffy-soft. I am sure it was meant to be a coffee table book. 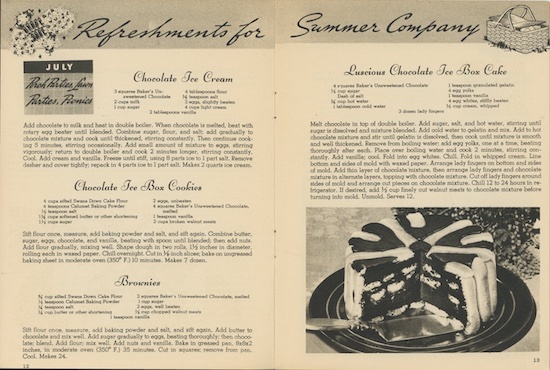 This book compiles Better Homes and Gardens magazine’s recipes from 1930 to the early 1970s. It’s sectioned into decades: the 30s, 40s, 50s, 60s, and 70s. Each section begins with a bit of history – good Americana. A full page photo of a sample magazine cover graces each historical review, and then a fold-out photo collage of memorabilia from the age. 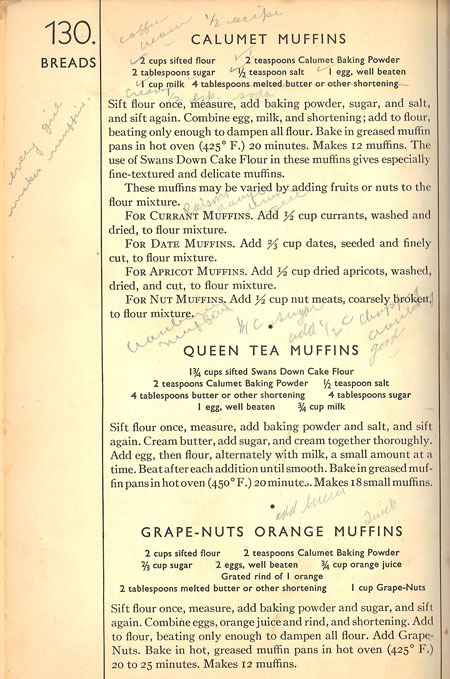 Each decade’s recipes are sectioned into representative featured recipes (recipes from restaurants or famous people, or popular trends such as home canning, barbecues, convenience cooking, or natural foods) and then a good collection of recipes from Better Homes and Gardens magazines of the decade. The Golden Treasury of Cooking is reviewed by The Iowa Housewife. She included some photos and recipes from the book that you might find interesting. 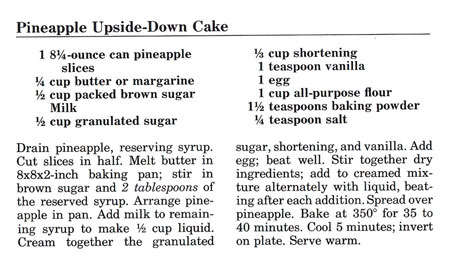 For this blog I decide to make Pineapple Upside Down Cake, from the 40s section. 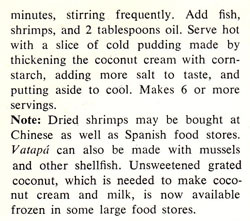 I currently have a recipe in my documents that I cobbled together, but I’d like to try this one. The only change I plan is to keep the pineapple rings whole, and put a maraschino cherry inside each ring. Drain the pineapple, reserving the syrup. 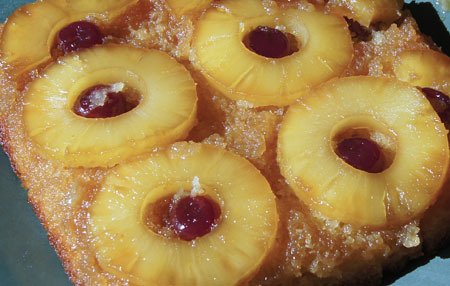 Melt the butter in an 8 x 8 x 2-inch baking pan; stir in the brown sugar and 2 tablespoons of the reserved pineapple syrup. 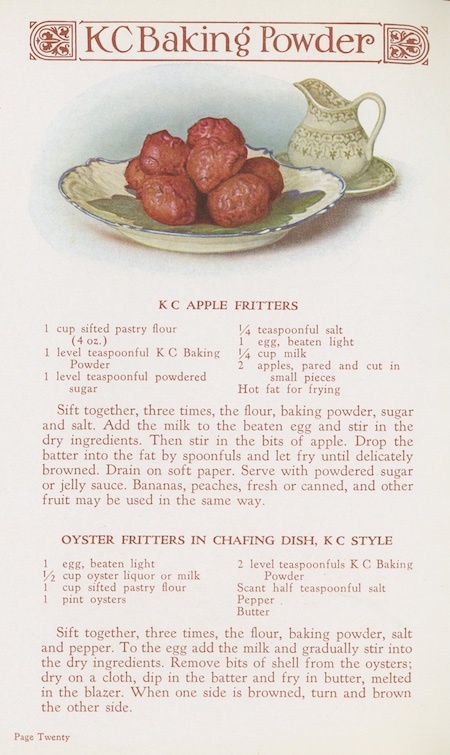 Arrange the pineapple rings in the pan – you might have to cut a few in half to cover the bottom of the pan. Put maraschino cherries into the center of each pineapple ring. Set the pan aside. Add milk to the remaining pineapple syrup to make 1/2 cup liquid. Cream together the white sugar, shortening, and vanilla. Add egg; beat well. Stir together the dry ingredients; add to creamed mixture alternately with liquid, beating after each addition. Spread the dough carefully over the pineapple-brown sugar mixture in the pan. Bake at 350˚ for 35-40 minutes, until the cake is turning brown around the edges. Cool 5 minutes and then invert carefully onto a plate. Serve warm with whipped cream. Oh yes, this was good! It has always been one of my husband’s favorite desserts. It was rich and sweet and very pineapple-y. Will I make it again, and do I recommend it? Yes to both. 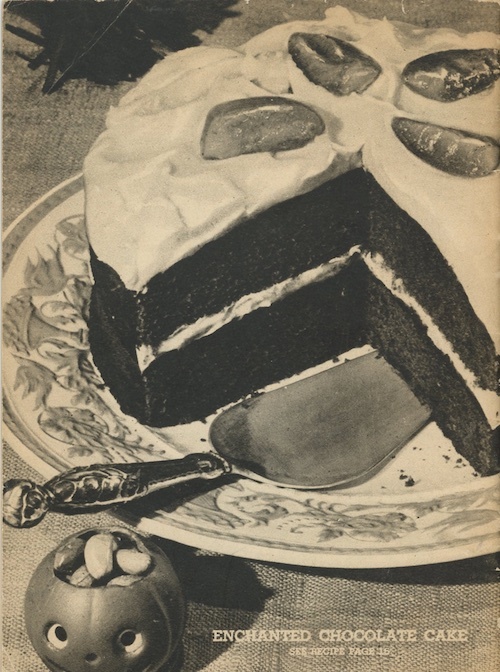 But next time I make this cake, I will compare and contrast the above recipe with my cobbled-together recipe. It’s almost too sweet, even for my taste! Cookbook #148: The Fannie Farmer Cookbook, Wilma Lord Perkins, Little, Brown and Company,Boston, Toronto, 1965. I think I found The Fannie Farmer Cookbook in an old house that we lived in from 1975-76. The house, known as “Walnetto” in our group of friends, was on Walnut Street in Boulder, at about 21st. The backyard of the house stretched back to a creek. We had a big garden. Chickens. Volleyball games. Parties. We could walk to downtown bars. I rarely drove my old VW bug because I could walk up to the university where I was a grad student. Once the house a couple doors down was on fire, and my boyfriend-now-husband pulled an elderly woman to safety. Of course those times are gone and the land is now covered with apartments and condos. But we have our memories. 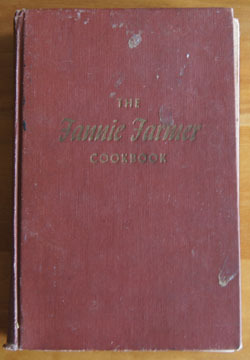 So what is The Fannie Farmer Cookbook? It’s important enough in American cooking history to have its own Wikipedia entry. I learn that Fannie Farmer, born in 1857, was raised in a family that valued education, but could not attend school because of a crippling illness as a teen. So she started cooking at a boarding house at her parents home. Her interest in cooking took her to the Boston Cooking School, where she excelled as a student and eventually became school principal. Fannie Farmer left the Boston Cooking School in 1902 to continue her teaching at Miss Farmer’s School of Cookery. She lectured on diets and nutrition for the sick at Harvard Medical School. “To many chefs and good home cooks in America, her name remains synonymous today with precision, organization, and good food” reads the current Wikipedia entry. Note that Fannie’s last edition was the 1914 one; Cora D. Perkins revised from the editions from 1915-1929 and Wilma Lord Perkins 1930-1965. After 1965, a few other editions were published; Marion Cunningham is listed as the author from 1979 on. I think the last issue was the 1996 Anniversary Hardcover edition. This is the first time I have really read my copy of The Fannie Farmer Cookbook. The writing style is friendly and clear and to the point. 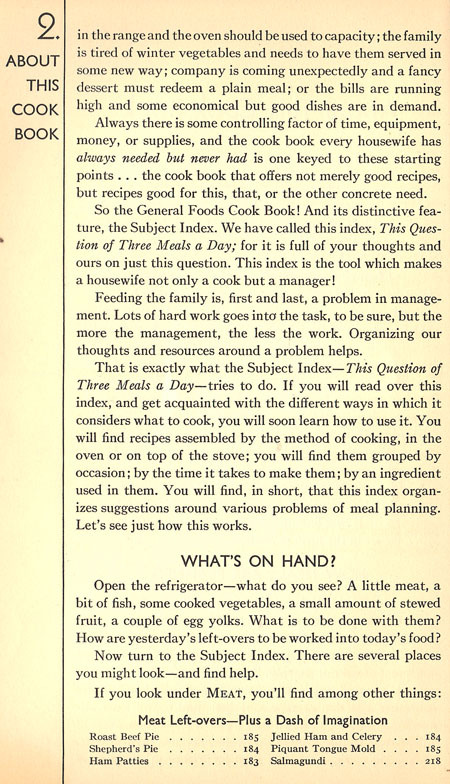 (One of my favorite American-standby cookbooks, The Joy of Cooking, tends to be a bit bossy.) It’s well organized and the index is almost 100 pages! 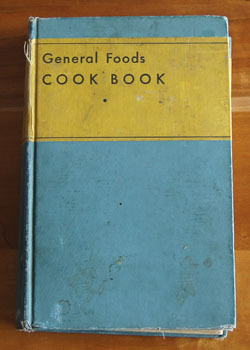 I am impressed with how the recipes still stand today as cookable. The clam chowder, with fresh shucked clams and salt pork, is a recipe I’d like to try. Roast guinea hen with a slice of bacon inside and more laid across the top also sounds interesting. Classics of American cooking like Boston Baked Beans. Alligator pears? Avocados! Recipes for leftover chicken and turkey. Sauerbraten and potato dumplings and Alfredo’s noodles. Cinnamon apples. 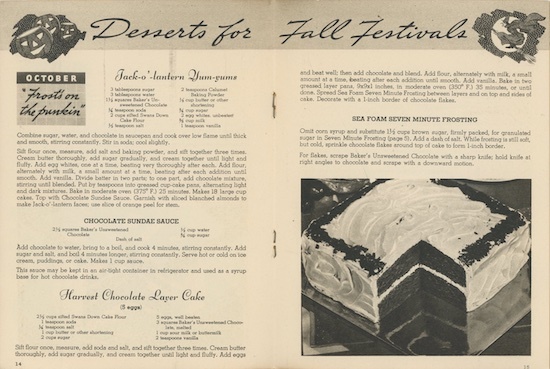 My favorite sections of The Fannie Farmer Cookbook are dessert recipes. I learn that “cottage pudding” is a classic American cake that can be frosted and/or filled. Fruit desserts include grunts and dowdies and dutch apple cake, cobblers and upside down cake. All of the recipes are made from scratch. I do like this book! I am going to make Apple Dumplings. At first I thought that the “dumpling” would be boiled but no, these are kind of like a baked apple wrapped in shortcake-biscuit dough and doused with sauce. It’s up to me to decide the type of dough and the type of sauce. 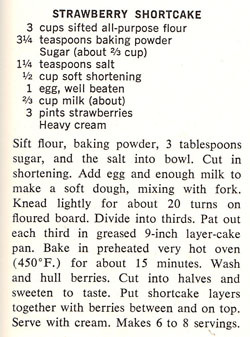 I choose a shortcake dough (p. 384) and the hard sauce (p. 402). Oh – I caught a mistake! The shortcake dough is on p. 484. As these were baking, my daughter said these would be best with ice cream. So I didn’t make the following hard sauce, which is simply a frosting made from butter and powdered sugar. I found that the shortcake recipe made just the right amount of dough for 5 small granny smith apples. You can adjust the amount of dough for the number of apples (e.g., servings) you desire, or you can use leftover dough to cook as biscuits. makes 5; best if you serve one per person! Pare and core 5 small tart apples. Mix the sugar and spices. Stir together the flour, baking powder, salt, sugar, and nutmeg. Cut in the butter with a pastry cutter or your fingers, or use a few pulses in a food processor. Stir in the milk, little by little, until the dough holds together but is still soft. Turn out on a floured board (fold over a few times if necessary) and roll to 1/4-inch thickness. 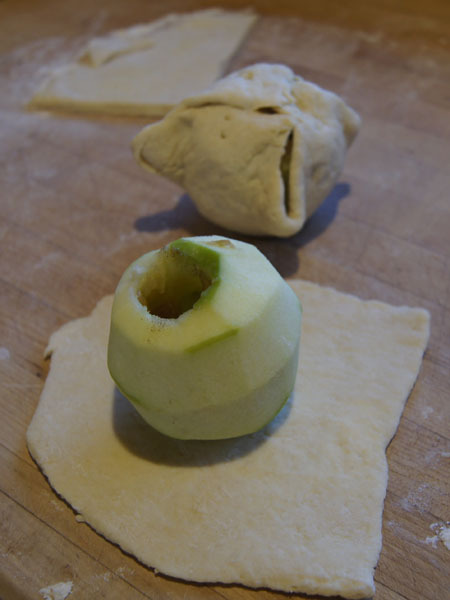 Divide the dough into 5 equal pieces and roll each to a size that will wrap up and around one of the apples. My rolled dough wasn’t really a square, it was more free form. 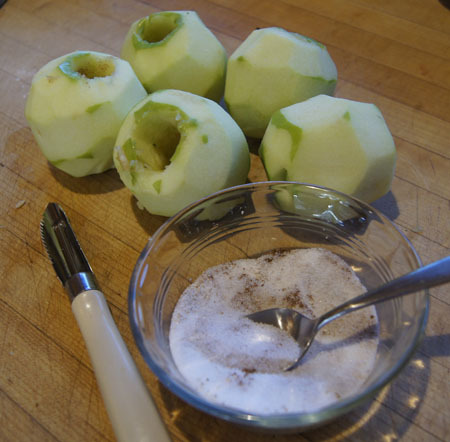 Place an apple on a piece of dough and fill the apple with some of the sugar-spice mix. Dot the inside with a little butter. Fold the dough up from four opposing sides and pinch together over the top of the apple. Continue until you finish all the apples and dough. 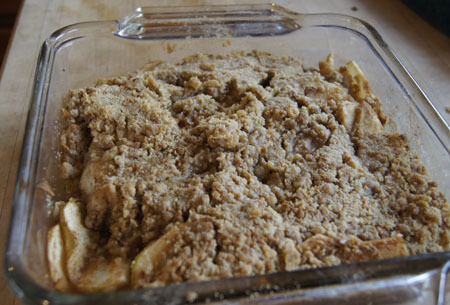 Place the apples in a baking pan so they are not touching. I sprinkled some of the remaining sugar-spice mix on top of the dough and highly recommend this step. Bake at 375˚ for about 45 minutes, until the dough is golden brown. Serve warm with ice cream. Great great great! These are delicious. So fun and different. We had never had anything like it before! 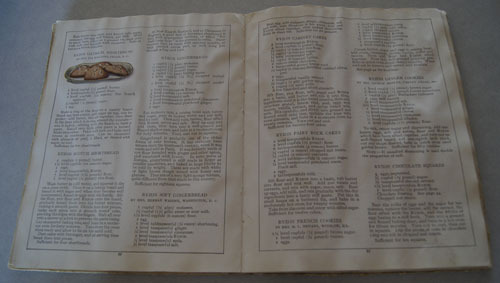 It will be interesting to compare The Fannie Farmer Cookbook with my 1906 edition of Farmer’s The Boston Cooking-School Cookbook. How much of the friendly style is Fannie’s or the revision author? What were the original recipes? A post to look forward to. 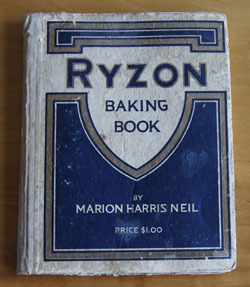 Cookbook #138: Ryzon Baking Book, Marion Harris Neil, General Chemical Company, 1917. 1917! 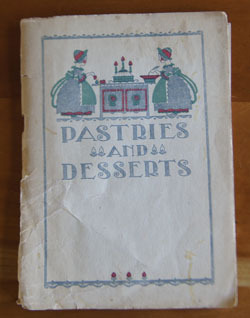 This was my grandmother’s cookbook. She turned the pages when my mother was only one year old. On one page there are crayon marks: Could they have been made by Mother? On another page my grandmother wrote some math calculations. She was good at math. The book is a bit water-wrinkled with a few sugar stains (and crayon marks) but otherwise in pretty good shape. It’s hard-covered, unusual for an advertising booklet. “Price $1.00” translates into $20.24 in today’s inflated dollars. 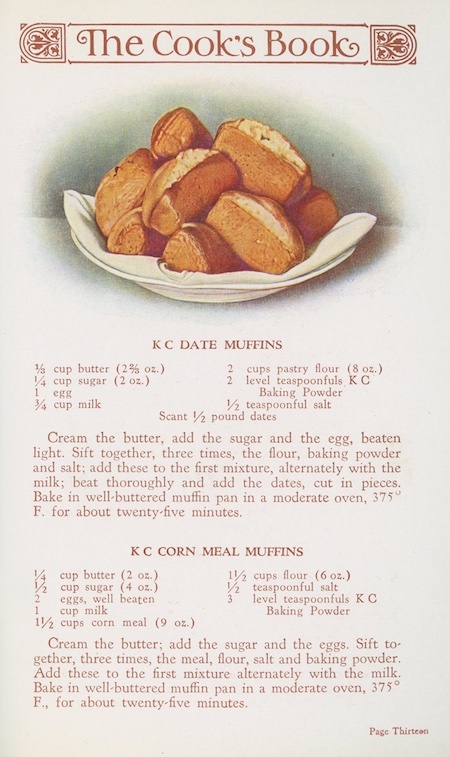 Another blogger wrote about this cookbook too: The History of Food and Drink Collection, What’s Cookin’ @Special Collections. “Ryzon”, what’s that? 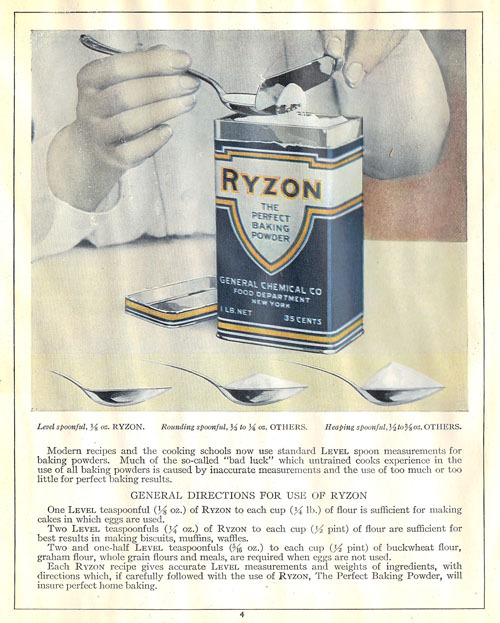 Ryzon was a brand of baking powder sold for a few years in the early twentieth century. What is baking powder? It is a chemical mixture that makes breads and cakes “rise” in the oven. It is called a “leavening agent”. 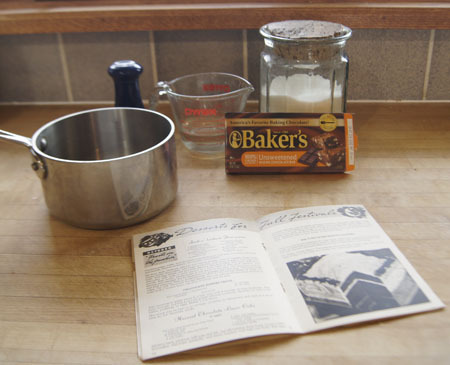 Before baking powder, yeast was used to leaven breads and cakes. 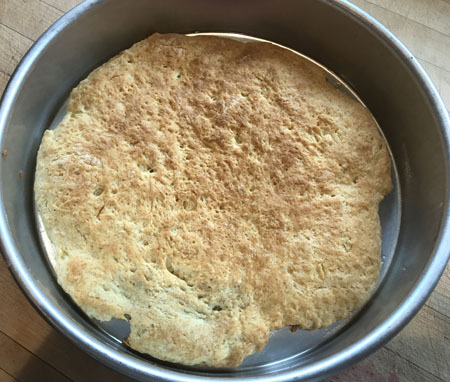 In a mixture of flour and water, yeast ferments, and on baking, the mixture releases carbon dioxide, putting little bubbles in the mixture and the bread rises. Yeast-risen breads and cakes tend to have a distinctive yeasty flavor. Baking soda is another leavening agent. It is sodium bicarbonate, a weak base that can be found in natural deposits. When baking soda is mixed with water, flour, and a small amount of an acidic ingredient like sour milk or vinegar, it too releases carbon dioxide on heating and causes breads and cakes to rise. Baking soda was used by the ancient Egyptians for paints; by the mid-eighteenth century it was used for baking. Baking soda breads tend to have a distinctive flavor of their own because one ingredient must be sour. Cornstarch is added to the weak base-weak acid mixture to keep the two from combining (and reacting) on storage. The cornstarch also keeps the baking powder from clumping. Percentages: baking soda 30%, weak acid 5-25%, rest is cornstarch. Baking powder gives virtually no flavor to baked goods (although some may argure this point, see the next paragraph) and bakers don’t have to include an acidic ingredient in the batter. It is simple to use because you don’t have to wait for a dough to rise. That’s why breads leavened with baking powder/baking soda are called “quick breads”. Cooks are often picky when it comes to their choice of the weak acid used in the baking powder product they use. Some don’t like aluminum-acid containing baking powders because the aluminum lends baked goods a metallic taste; some believe aluminum is not be good for your health. Some baking powders are “double acting”, meaning they contain two different weak acids, one that starts acting as soon as water is added and one that doesn’t act until it is heated in the oven. 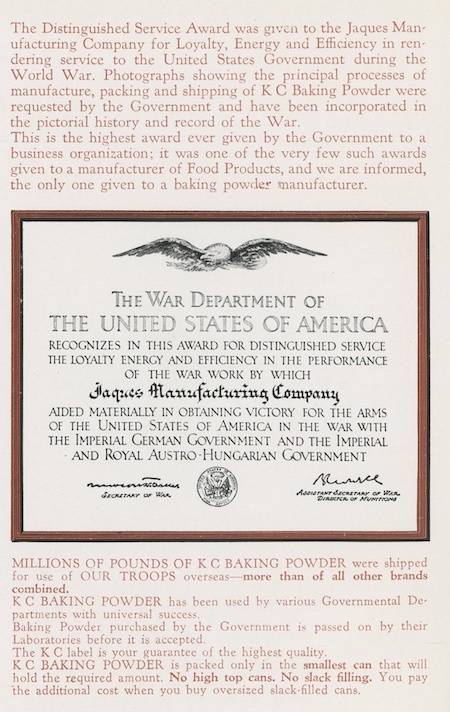 Ryzone was a single-acting baking powder: it used only monosodium phosphate. 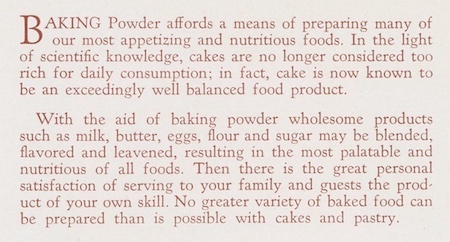 The Ryzon Baking Powder cookbook claims that phosphate baking powders are the most desirable. One section raves about the purity of their monosodium phosphate and the cleanliness of their factory and workers. What kind of baking powder do I use? I generally use whatever brand my local supermarket sells. Currently I have an open can of Clabber Girl Double Acting baking powder in my cabinet. The acids in this brand are sodium aluminum sulfate and monocalcium phosphate. I also have a new can of Bakewell Cream (purchased from King Arthur Flour) that includes only the weak acid sodium acid pyrophosphate (although they claim it is double acting). All this might be boring to you, but for me – as a chemist and as a cook – I liked reviewing a baking process I use all the time. Baking soda is the choice when you use sour milk (buttermilk) or yogurt in the batter. Recipes often call for a combination of baking soda and baking powder. This is because double acting baking powder gives an extra “umpf” when the batter is heated. Baking powder is a less-concentrated leavening agent than baking soda because it has a filler (cornstarch). It is 30% baking soda, while baking soda is 100%. Be careful not to use too much baking powder, because if it is not all used in the baking process, it might lend a metallic taste to your baked good. If you are out of baking powder but have cream of tartar, you can substitute: mix two parts cream of tartar with one part baking soda. Rule of thumb: use one teaspoon of baking powder per cup of flour in a recipe that does not have an acidic ingredient. Rule of thumb: use 1/2 teaspoon baking powder and 1/4 teaspoon baking soda per cup of flour and cup of buttermilk. 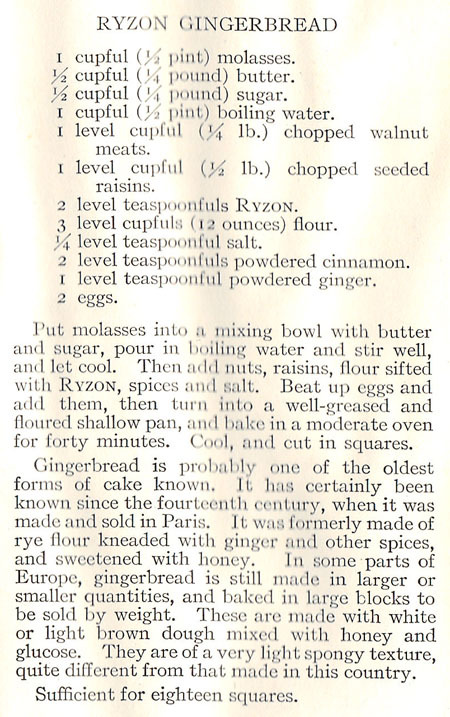 I decide to make Ryzon Gingerbread for this blog (and for us!). I have always liked gingerbread, but I don’t make it a lot. In fact, I don’t even have a “go to” recipe for plain old gingerbread (I do make a great Apple Gingerbread Cobbler). This Ryzon recipe has lots of molasses in it, which is considered a healthy-ish sweetener. (I am surprised at how many of the recipes in this Ryzon cookbook are called “health breads” and have whole wheat flour in them.) And it has nutritious raisins and nuts. The recipe calls for “a shallow pan” – I chose a 9-inch square pan and it worked fine. A “moderate” oven is 350-375˚ – I chose 375˚. Below is my version. Combine the molasses, butter, sugar, and water in a pan and heat gently (with stirring) on the stove until the butter melts. Remove from heat and let cool. Butter and flour a 9-inch baking pan (or a 7×11-inch pan). Heat the oven to 375˚. Combine the nuts and raisins on a cutting surface and chop roughly. (You can, of course, chop them in any way you like.) Add the nut/raisin mixture to the molasses mixture. Stir together the baking powder, salt, cinnamon, ginger, and flour and then add it to the nut/raisin/molasses mixture. Beat the eggs and add them too. Pour the batter into the prepared pan. Bake at 375˚ for 40-50 minutes, until it is nicely browned and pulls away from the sides of the pan. I really enjoyed this gingerbread. Gingery and molassesy. 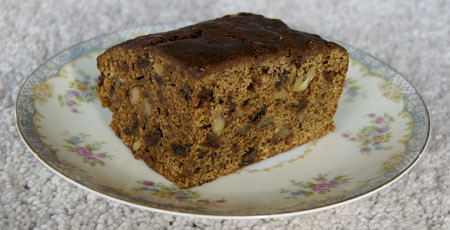 And dense with nuts and raisins. We had it for dessert with cool whip. It’s also good for snacking during the day, and for breakfast! 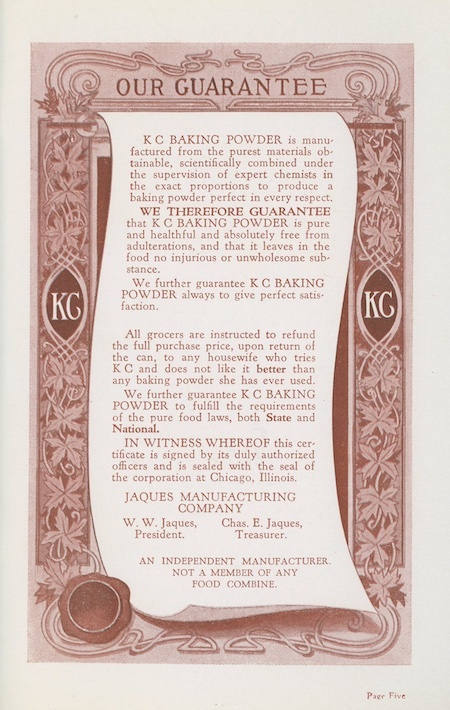 Note: after writing this post, a friend alerted me to posts on the Serious Eats blog on baking powder and baking soda. Excellent discussions. 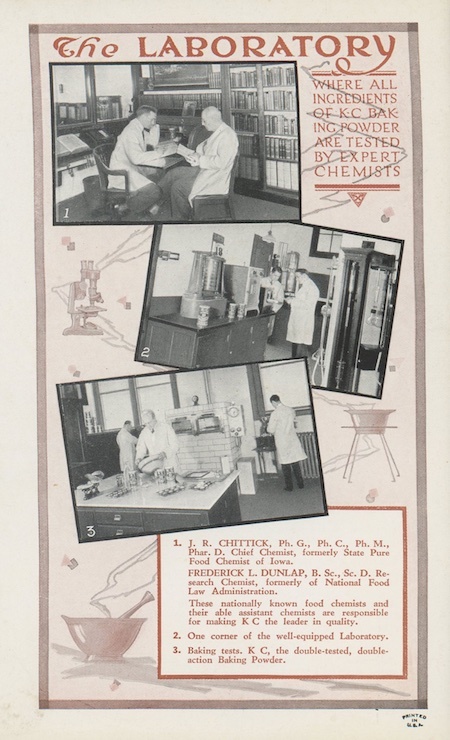 I also like the page that describes how to measure a level teaspoon and the two inside-cover pages from the back of the book that talk about the General Chemical Company factory. 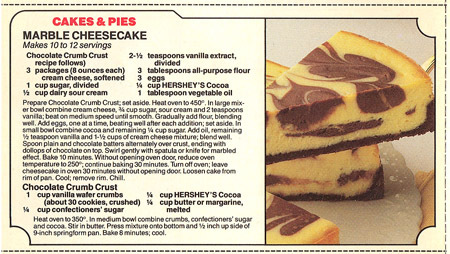 Cookbook #85: Hershey’s Chocolate Recipe Collection, Hershey Foods Corporation, USA, 1989. 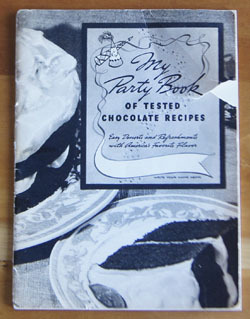 This is a pamphlet with 96 chocolate recipes, each on a “card” that can be torn out of the book along the perforations. The booklet doesn’t have an introduction; the last page gives some tips for handling chocolate. 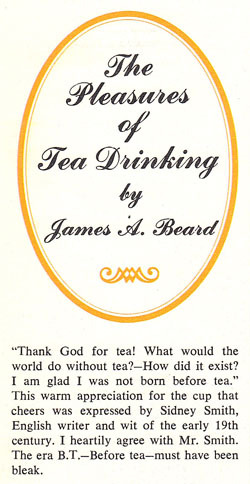 This was one of my Mother’s cookbooklets. She didn’t mark any recipe, nor did she tear one out. That’s it, short and simple. 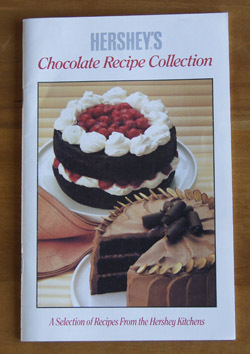 I love chocolate and though I have decided to recycle this cookbooklet, some of the recipes do tempt me. But not the ones that rely on cake or muffin mixes or purchased pie shells, just the from-scratch recipes. 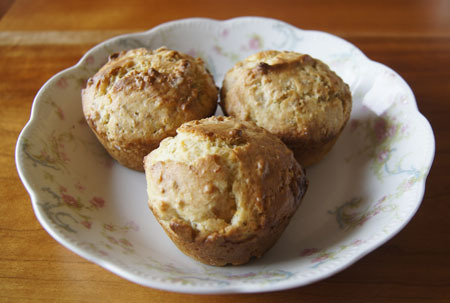 I note a couple recipes that incorporate ideas I came up with on my own over the years, like putting chocolate chips in muffins and quick breads. Yum, this one sounds good: Mini Chips Blueberry Bread. Chocolate Cherry Upside-down Cake would be lovely. 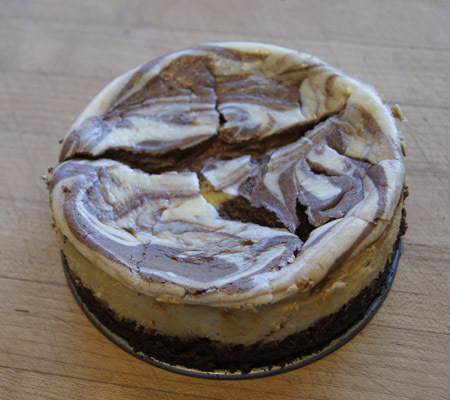 Marble Cheesecake, a delicious combination of chocolate and cheesecake. And Chocolate Mousse Pie (with rum cream topping). And the chocolate waffles. Sigh. If calories were not an issue . . .
Ah, but I have a solution! Lately I have started baking mini-desserts for the two of us. That way, no leftovers! Serendipity brought me to this innovation. First, the Lyons flood in September 2013. I became involved with Lyons recovery efforts, including shopping support at our local businesses, and I discovered Lyons Buttonrock Bakery. I took to buying one of their small fancy desserts – tiramisu, tarts, flourless chocolate cake, eclairs – to split with my husband for Saturday night desserts. One of our favorites is their cheesecake. Ever the cook, I then wanted to make my own two-person cheesecakes. I found a couple small springform pans in a local store and went in search of a recipe. Online I found a recipe for a 4.5-inch cheesecake on this great site: Dessert For Two. Her Cheesecake with Honey-ed Peaches is fantastic! So I decide to make Marble Cheesecake from the Hershey’s Chocolate Recipe Collection, downsizing the recipe to 4.5-inch pans to make “dessert for two”. I’ll need to modify both the batter amount and the baking time – I’ll use the Cheesecake with Honey-ed Peaches recipe as a guideline. Below is my modified version. I have two 4.5-inch springform pans, so I plan make two small cheesecakes, one for Saturday and one for Sunday. First, make the crust, since it needs to bake and cool before you fill it. Heat the oven to 450˚. Crush the vanilla wafers and combine with the sugar, cocoa, and butter. Press the mixture firmly onto the bottom and a little up the sides of 2 (or 3, see my notes below) of 4.5-inch springform pans. Bake for 8 minutes and then let them cool. Lower the oven to 300˚. In a mixer, combine the cream cheese, 3/8 cup sugar, sour cream, and 1 teaspoon vanilla, beat until smooth. Add the flour and eggs and beat well, but don’t go crazy and overbeat it because that can cause the cheesecake to crack when it bakes. Remove about 3/4 cup of the batter to a small bowl. Mix the 2 tablespoons cocoa with 2 tablespoons sugar, then add to the batter in the small bowl along with the oil and 1/4 teaspoon vanilla. Spoon dollops of the plain and chocolate batters alternately into the pie crusts, ending with the chocolate batter. Swirl gently with a knife to marble the batters. Swirl enough to get any bubbles out of the batter, but do not overswirl or it will not be marbled. Place the cheesecake pans on a baking sheet and bake at 300˚ for 40 minutes, until the center is “slightly jiggly but not wet when you lightly touch it.” Leave the cheesecake in the oven after the 40 minute baking period, but turn the oven off and prop open the door. After 30 minutes, move the cheesecake to a wire rack on the countertop and let cool another 30 minutes. Then, run a knife around the edges of the pans, loosen and remove the outside rings of the pans, cover the cheesecakes with plastic wrap, and refrigerate at least 5 hours. Here are my crust ingredients. The melted butter is in the red bowl. 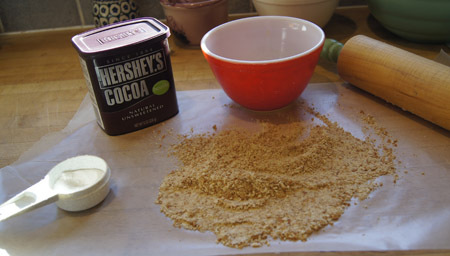 I used real Hershey’s cocoa, although I usually keep a fancier version in my pantry as well. The next photo is a few steps later, after the crust is baked and the filling loaded into the springform pans. The two pans already look too full, in my judgement, and I still have more batter left. I put the extra batter in a small ramekin and baked it along with the filled springform pans. From my calculations, it shouldn’t have been too much batter, but it was. I was not at all surprised to find that the cheesecakes had cracked when I peeked at them after the 40 minute baking period. At first they were really tall; by the time they had cooled, they had fallen a bit. But you can still see the cracks clearly in the photo below. I definitely will make these again. To keep them from cracking, I will try a couple things next time. Obviously – despite my calculations – there was too much batter to fit into two small pans. Next time I will use three 4.5-inch pans. Also, I forgot to put the springform pans on a baking sheet in the oven. Maybe that will help. 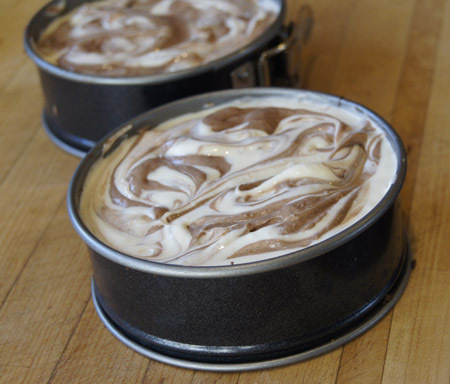 I look forward to experimenting again with Marble Cheesecakes in Mini-pans.